The origin of binary stars has long been one of the central problems of astronomy. One of the main questions is how stellar mass affects the tendency to be multiple. There have been numerous studies of young stars in molecular clouds to look for variations in binary frequency with stellar mass, but so many other effects can influence the result that the results have been inconclusive. These complicating factors include dynamical interactions between stars that can eject one member of a multiple system, or on the other hand might capture a passing star under the right circumstances. Some studies, for example, found that younger stars are more likely to be found in binary pairs. One issue with much of the previous observational work, however, has been the small sample sizes. CfA astronomer Sarah Sadavoy and her colleague used combined observations from a large radio wavelength survey of young stars in the Perseus cloud with submillimeter observations of the natal dense core material around these stars to identify twenty-four multiple systems. The scientists then used a submillimeter study to identify and characterize the dust cores in which the stars are buried. They found that most of the embedded binaries are located near the centers of their dust cores, indicative of their still being young enough to have not drifted away. About half of the binaries are in elongated core structures, and they conclude that the initial cores were also elongated structures. After modeling their findings, they argue that the most likely scenarios are the ones predicting that all stars, both single and binaries, form in widely separated binary pair systems, but that most of these break apart either due to ejection or to the core itself breaking apart. A few systems become more tightly bound. Although other studies have suggested this idea as well, this is the first study to do so based on observations of very young, still embedded stars. 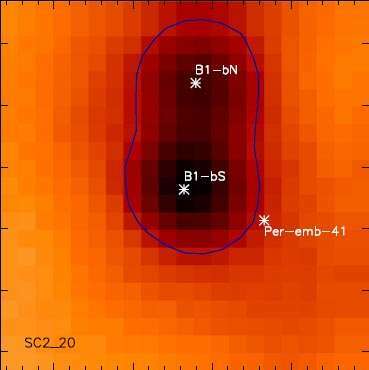 One of their most significant major conclusions is that each dusty core of material is likely to be the birthplace of two stars, not the single star usually modeled. This means that there are probably twice as many stars being formed per core than is generally believed.